In 2015, with the support of the Ministry of Education, Culture and Sport of Georgia, Tbilisi State Chamber Orchestra “Geor­ gian Sinfonietta” founded the annual Tbilisi Baroque Festival. IT has since been visited by the best performers of Baroque Music, including Jordi Savall, Sergio Azzolini, Christine Busch, Jean Rondeau, Davide Amadio, Orchestra “Akademie fur Alte Music Berlin” and others. On November 25, for the first time in Georgia, Mozart’s ‘Requiem’ will beperformed with period instruments, including a positiveorgan, on loan to Tbilisi from famous mentor Claus Hipp. The performers are: the Tbilisi Baroque Choir, the ‘Georgian Sinfonietta’ and the musicians of Ensemble Zefiro and the soloists are: Mariam Kublashvili (soprano), Nutsa Zakaidzemezzo (soprano), Giorgi Davitadze (tenor), and Givi Gigineishvili (bass). On December I, 2 and 3, for the first time in Georgia,at the closing ceremony ofTbilisi Baroque Festival, ‘Georgian Si nfonietta’ and Giorgi Aleksidze Tbilisi Contemporary Ballet (Artistic Director Mariam Aleksidze)will present Contemporary Ballet ‘Folia’ at the Royal District Theatre. Scienti fic and educational lectures and workshops will be held within the frames of the Festival. The participants of the festival also include: Tbilisi Baroque Choir, Mikheil Abrarnishvil i (coun­ tertenor), Anna Kurdovanidze (harpsichord , positive organ), Alexander Vasadze (harpsichord , positive organ), Etienne Galletier (theorbo , baroque guitar, France), Francesco Olivero (theorbo / baroque guitar,Italy), George Kobulashvili (oboe), Kakhl Chargeishvili (Salamuri), and Merab Sanodze (drums). 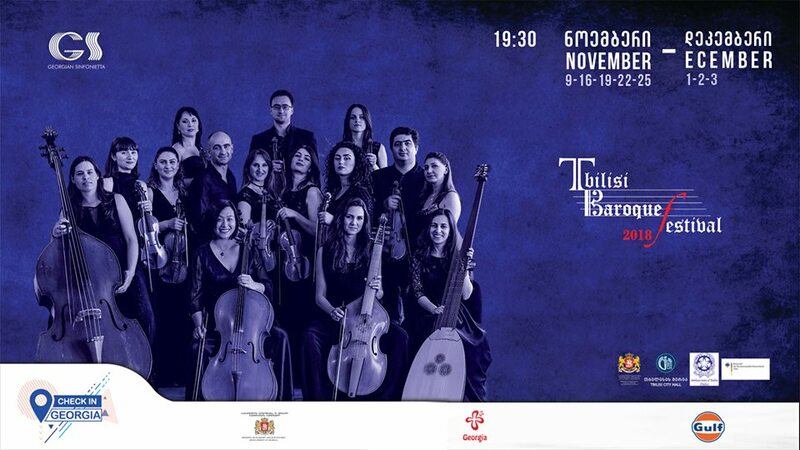 Tbilisi Baroque Festival Concerts will be held: on November 9, 16,19 and 25at Rustaveli Theater Small Stage; The Final Even ings will be held on December I, 2, and 3 December at the Royal Dis­ trict Theater; at 19:30.Tickets are available at host theater box offices and online at www.biletebi. ge.